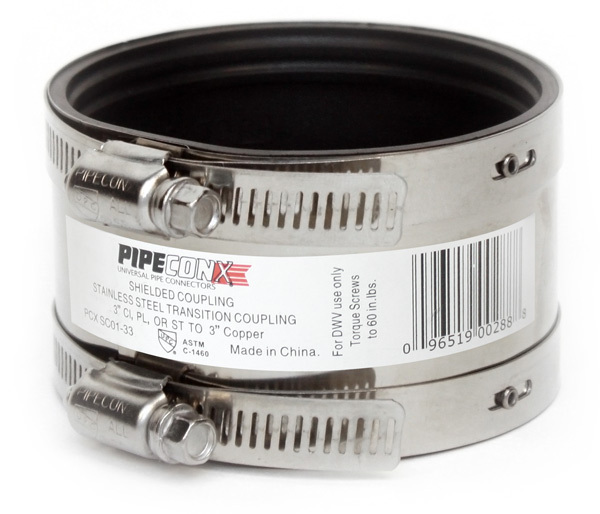 PIPECONX Shielded Transition Couplings are designed and manufactured to improve performance and pipe alignment in areas that require added shear strength for heavy loads. PIPEFLEX allows you to make transition pipe connections that are resistant to shoe forces, while creating a rigid, long-lasting pipe joint. From one and a half inches to 8 inches-pipe flex connects cast-iron, plastic, steal, copper and tubular drain waste and vent systems.